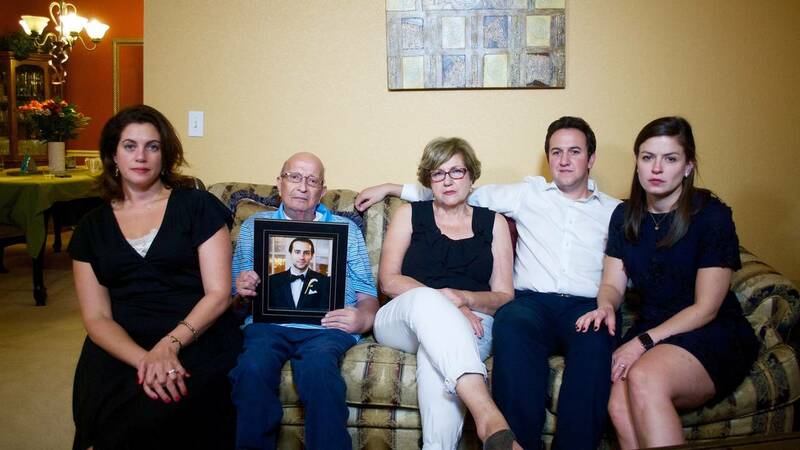 TULSA, Oklahoma (CNN) - An Oklahoma man who harassed and attacked members of a Lebanese family living next door was found guilty Wednesday of first-degree murder, a hate crime and other charges in connection with the 2016 slaying of Khalid Jabara. In addition to murder, Stanley Vernon Majors, 63, was found guilty of malicious intimidation or harassment, a hate crime, and threatening an act of violence, both misdemeanors. He was found guilty of another felony -- possession of a firearm in the commission of a felony -- during the jury's second set of deliberations. "We agree that justice was served," Victoria Jabara Williams, Khalid Jabara's sister, told reporters. But she noted that when Majors gunned down her brother, he was out on bail, accused of running down her mother with his car 11 months before. "My family and I still maintain that this case shouldn't have happened," she said. "We shouldn't have to be here and Khalid should still be with us." Authorities have said that in August 2016, Majors went next door, up the front steps onto his neighbor's porch, and shot and killed Khalid Jabara outside the home. They say he did it because the Jabara family is from Lebanon and Majors is a hateful bigot. During the trial, Majors' team built an insanity defense. His attorneys said this is not a case about hate, race or religion, but about a man so mentally ill he viewed the family next door as a threat. Majors feared the Jabaras, whom he thought were Muslims, would harm him because he is gay. Psychiatrist Jason Beaman testified for the defense on Monday that Majors has schizophrenia. "Majors was not able to understand the consequences of his actions" at the time of the shooting, he said. One of Majors' attorneys, Justin Smith, said after the verdict that the defense would appeal the convictions after Majors is formally sentenced on February 20. "We still are under the impression and belief that our client has a severe mental illness," he said. "But we still respect the decision of this jury." The jury on Wednesday recommended maximum sentences of life in prison without parole for murder, up to 10 years for possession of a firearm in the commission of a felony, one year for the hate crime, and six months for the violent threats. Prosecutors said there is no death penalty in cases like this that have no aggravating factors. In September 2015, Majors allegedly ran down Jabara's mother, Haifa Jabara, with his car. She suffered a brain hemorrhage, broken ribs, a broken ankle, a damaged shoulder and a broken bone in her arm. Majors was charged in connection with the hit and run and was jailed as he awaited trial. He was eventually released on bail. Two months later, before the hit and run case could go to trial, Haifa Jabara heard on the phone the sound of her son being killed. Jabara's parents testified on the second day of Major's murder trial. Haifa Jabara recalled how her son had a good relationship with Stephen Schmauss, who lived next door, until Majors moved in with Schmauss. Haifa Jabara said Majors, who later married Schmauss, was hateful and prejudiced against their Lebanese ethnicity. She said he once threatened to "kill us all." Jabara told the court her son called her the day of the shooting to tell her not to come home because Majors had a gun. Majors only spoke once during the trial, to tell the judge he wouldn't testify. The Jabara family previously told CNN that Majors would stand on the property line between their homes and shout, "Dirty Arabs!" He called the family "Mooslems" and "dirty Lebanese," the Jabaras said -- even though they're Christians who fled civil war and religious persecution in Lebanon decades ago.